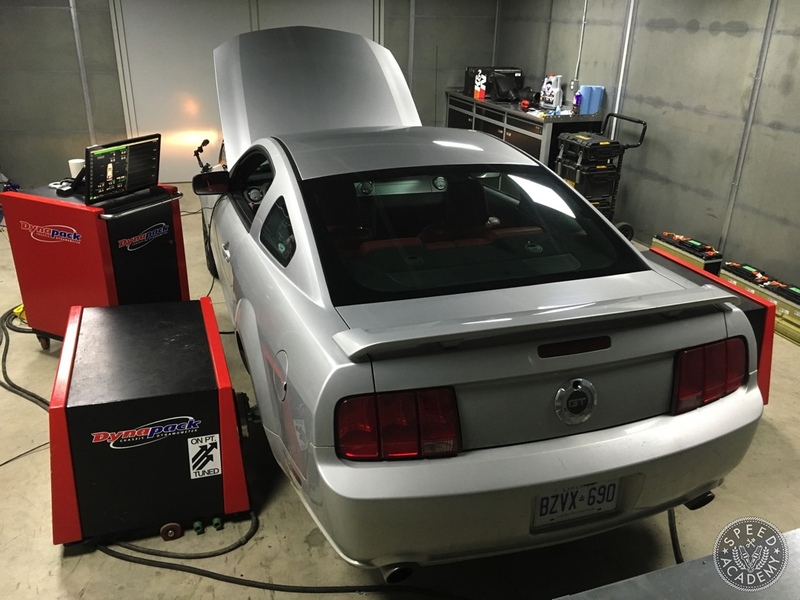 After a bit of a hiatus, we’re back to work on the Mullet Mustang, our 2005 Ford Mustang GT project supported by Turn14 Distribution, and we’re off to a solid start for 2017 with some impressive power gains on the OnPoint Dyno Dynapack chassis dyno. To properly evaluate the intake and exhaust mods separately, before we bolted the rear hubs up to the Dynapack we reinstalled the OE intake system. 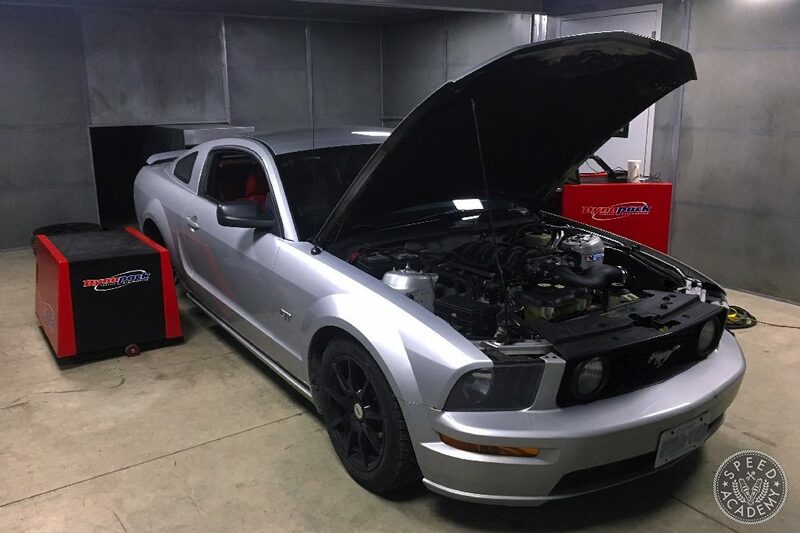 With the stock intake in place along with the Turn14-sourced Borla long tube headers, x-pipe (which deletes the catalytic converter) and Touring mufflers we covered in an earlier story, Sasha from OnPoint made a few dyno runs and the results were pretty mindblowing. That’s what a 38-whp gain looks like, along with a whopping 45 extra ft-lbs of torque at the rear hubs. Gotta give it up to Borla, because their long tube headers, x-pipe and Touring mufflers deliver big-time power gains and do it without making the car any louder while cruising but adding a pleasingly aggressive growl when we stomp on the go-pedal. 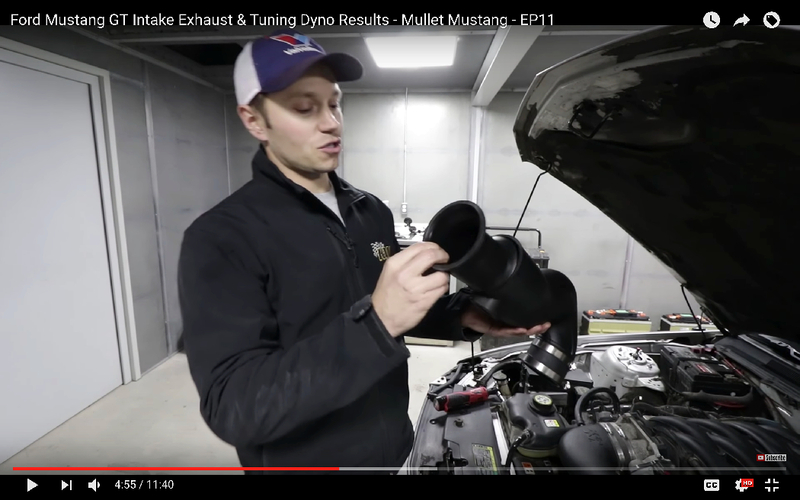 Next we reinstalled the K&N FIPK intake system we showed you in the same episode as the headers and exhaust parts were installed. If you haven’t seen that episode yet, check it out above. 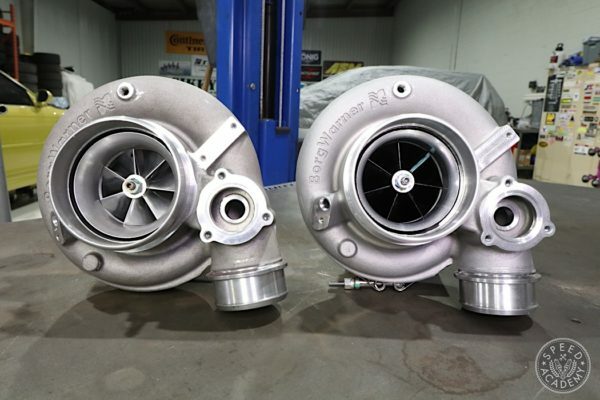 The K&N intake delivered some solid power gains across the top part of the powerband, with a peak to peak gain of 9-whp and 10-wtq. Next, we decided to test the assertion of a few YouTube commenters that the AIRAID MXP intake system makes more power on this engine. 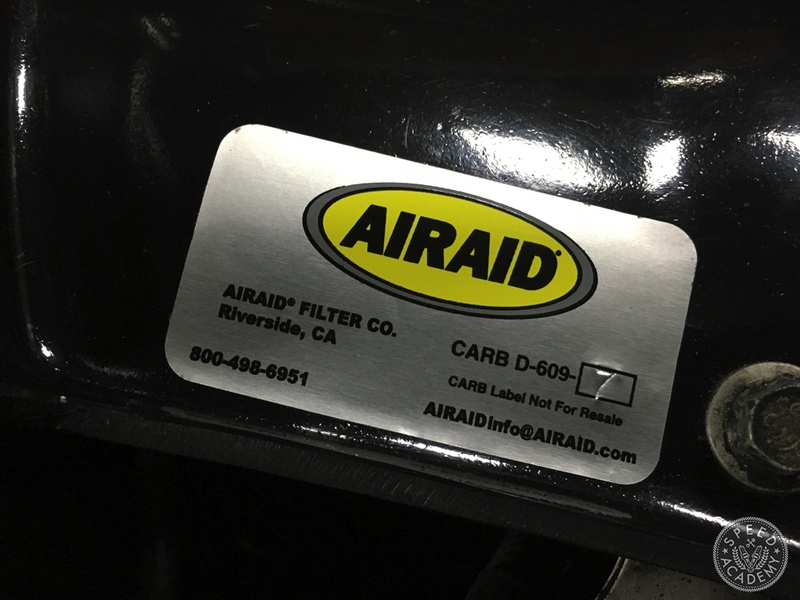 We were both very impressed by the build quality of the one-piece roto-molded air box as well as the large diameter, smooth radius bends of the cross-linked, high-density polyethylene intake tube. As you’ll see in the dyno video at the end of this story, it also has a removable OE size MAF housing so that you can choose between the OE diameter so you don’t have to recalibrate the MAF, or you can pull the OE diameter housing out and recalibrate the MAF for the larger 4” diameter tubing with a tool like the SCT X4 Performance Programmer we’re using. With the OE sized MAF insert in place, the AIRAID system did pick up a nice bit of power over the K&N system, with a peak vs peak gain of about 3-whp and 4-wtq. We then removed the OE MAF housing insert and Sasha recalibrated for the 4” diameter tubing using the SCT’s Advantage III tuning software. This didn’t yield a measurable power gain, but we suspect it will pay dividends once we upgrade the cams. 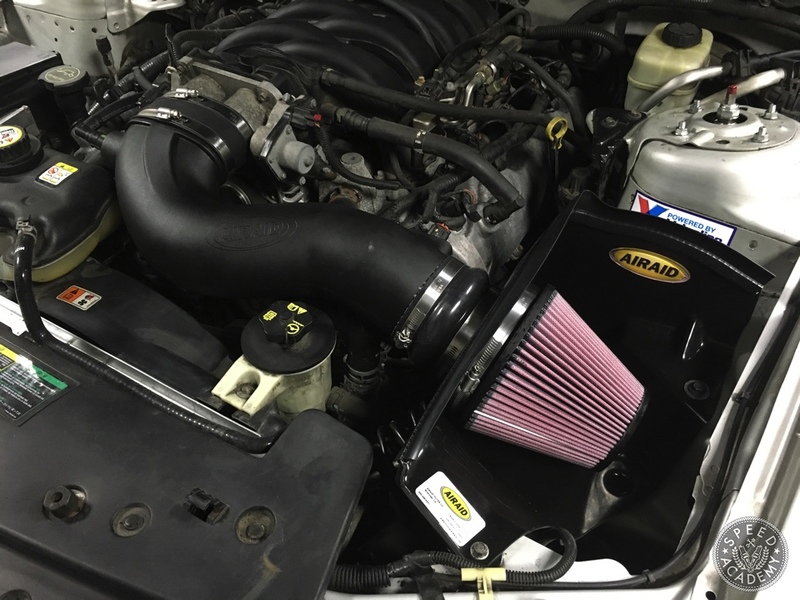 Next, Sasha uploaded one of the built-in tunes that come standard on the SCT X4, selecting the upgrades that were as close to ours as possible (there was a long tube header, exhaust, and K&N intake option). This tune is meant for 93 octane fuel at a minimum, so I filled the Mullet up with Sunoco 94 on the way to the dyno. 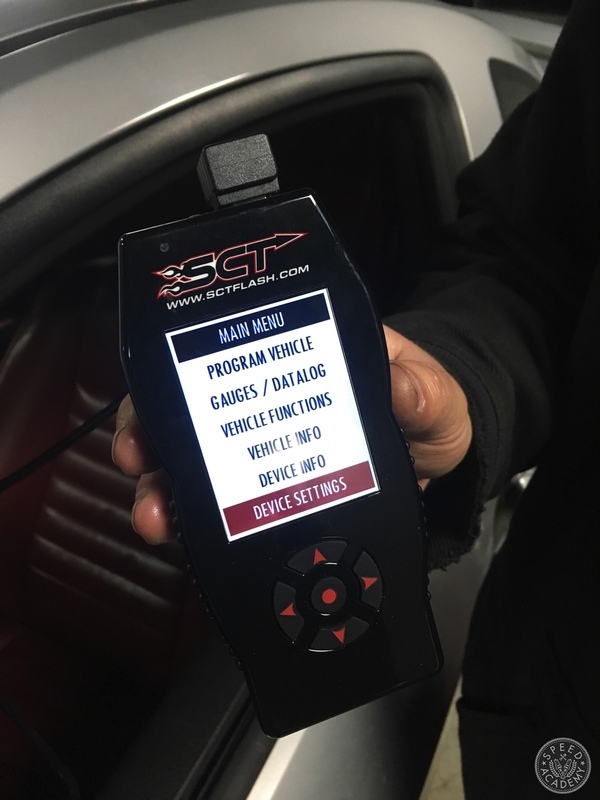 I should also mention that the SCT X4 isn’t just an ECU reflashing device, it’s also a diagnostic trouble code reader and clearer, a datalogger, and has real-time gauge options too, all displayed on a bright backlit LCD screen with a very easy-to-use interface. We think it’s a serious bargain at $399. Oh, and it’s dead easy to flash your ECU back to stock, so if you have a newer car that’s still under warranty you don’t have to worry about that. 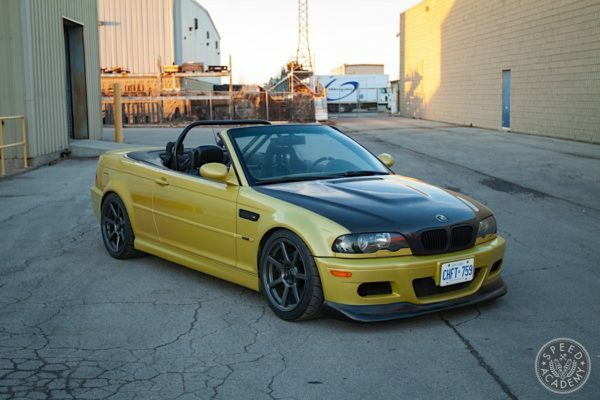 We saw very little power gain from the built-in tune, which Sasha attributed to the fact that the engine was already making very good power for a 4.6L 3V Modular V8 with basic bolt-ons, so there just wasn’t much room for improvement. 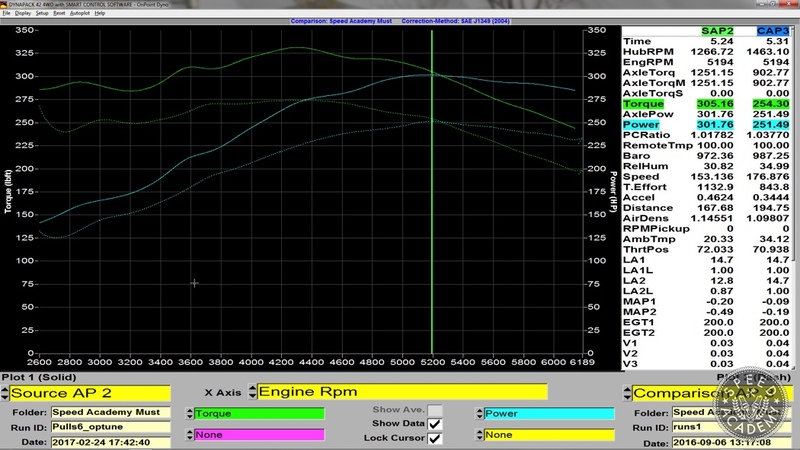 Sasha then spent some time customizing the fuel and ignition tables using the Advantage III software and he did manage to squeeze a bit more power out of it, bringing peak horsepower up to a whisker shy of 302-whp and peak torque up to a very tasty 331 ft-lbs. At the end of the day, looking at where the Mullet began and where it is now, the gains across the powerband are really very impressive. We netted out 52-whp and 57-wtq, so all in all, we’re pretty pumped about that and the car does feel a lot quicker as a result. 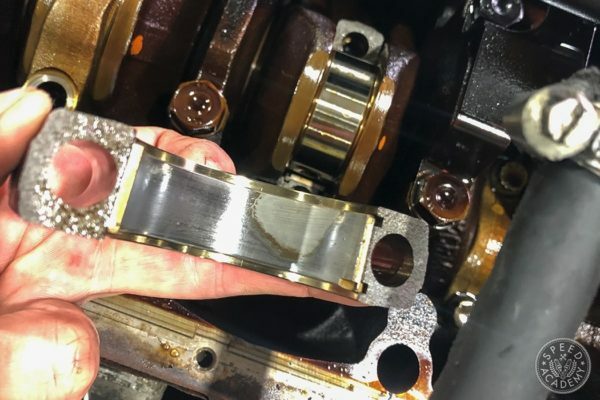 With a pair of upgraded camshafts, some stiffer valve springs for more RPM, and a retune, we’re confident the Mullet will pick up a bunch more power since the torque peak is nosing over pretty early at 4400 RPM. Check out the dyno video for all the action in moving pictures (with sound! ), and keep your eyes peeled for the next episode on the Mullet Mustang Presented by Turn14 Distribution over on our YouTube channel. As a matter of fact, why don’t you just head on over there and hit the Subscribe button while you’re at it? It won’t hurt a bit, we promise. 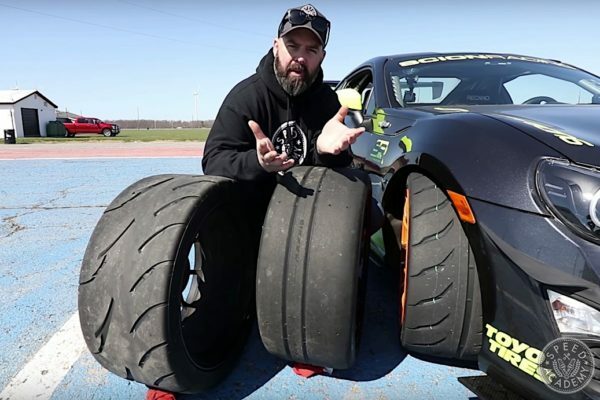 In our last update on the prep work we’re doing on our Scion Racing FR-S for Ontario1500, we showed you in detail how to install the Jackson Racing supercharger kit….